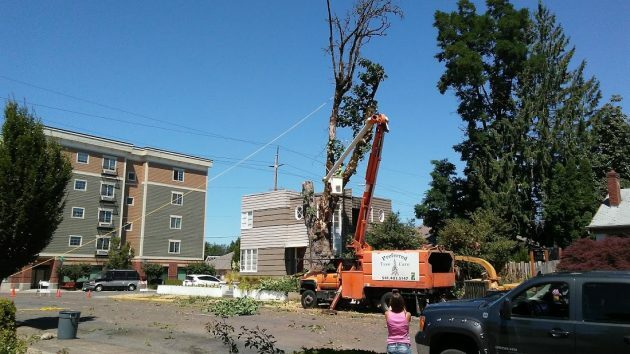 On Saturday, at the corner of Third and Calapooia, a crew from Preferred Tree Care of Corvallis was taking down what was left of a once-towering maple. You can see the high point of the operation in the video. One of the men told me he estimated the maple’s age to be around 150 years and its height at about 100 feet. But some time ago a big branch broke off and crashed to the street below. Where it broke off showed signs — to my untrained eye — of internal decay. So it had to go before doing any damage as it died a natural death. You can see the line attached to the upper part of the tree. Any plans for a replacement? Like in the previous “honey” sign story which I enjoyed! Driven that stretch too many times to count. Always sad to see a big old tree go, especially a big-leaf maple. At least no damage was done to the neat-o International Style house behind it. O.K., it wasn’t in a forest so did anyone hear the crash! We prefer Japanese maples owing to their smaller size. Have four of them in our yard. But, we back up to what had been years ago a monster of a big leaf in our neighbors yard that has been hacked & wacked & reduced to make way for power lines down between the middle of our yards. What a sight it must have been in it’s younger days. It’s an unfortunate deal that in the making of the “Talking Waters” park that large trees couldn’t have been place there during construction. We’ll miss it during our remaining years but our grandchildren may see some proper trees there. If you watch the video, pay attention to how the trunk shatters when it hits, that means it was rotten….. Your coverage of area events and News is astoundingly prolific. The management types over at the Democrat-Herald, with all their staff and technology, don’t do half the coverage Hering generates from the saddle of his trusty bicycle. Lee Enterprises must rue the day they parted ways with Hasso Hering. They should also be embarrassed. Have to wonder if it could have benefited from better care 50ish years ago. The pruning technique then was to trim all the way back to the bole and let the tree scar over the cuts. Current practices leave more wood and provide smaller portals for disease. Usually the tree is “decayed” is just an excuse by someone that wants to get rid of a perfectly good historic tree. In this case the way the tree broke apart when it hit the ground shows that it really was mostly dead wood.